Picture this: you are heading out the door from work, get into your car, turn the keys, and as you look up and get ready to drive, you see it. Your windshield is cracked. Windshield cracks don’t just appear out of nowhere. Even if your car was parked away from the street, changes in temperature or sunlight can cause cracks. A poorly manufactured or repaired windshield may crack under a small amount of pressure. Your windshield may crack on the road if it is hit by loose gravel, rocks, or hail. Virtually everyone has experienced this frustrating life interruption. And while easy to dismiss, the reality is whether you have a big or small windshield crack, it can (and probably will) get bigger if you do not take proper precautions. Not all windshield cracks will require immediate replacement, but every inch of damage requires immediate attention. So read on for more information on how to stop your windshield crack from spreading. 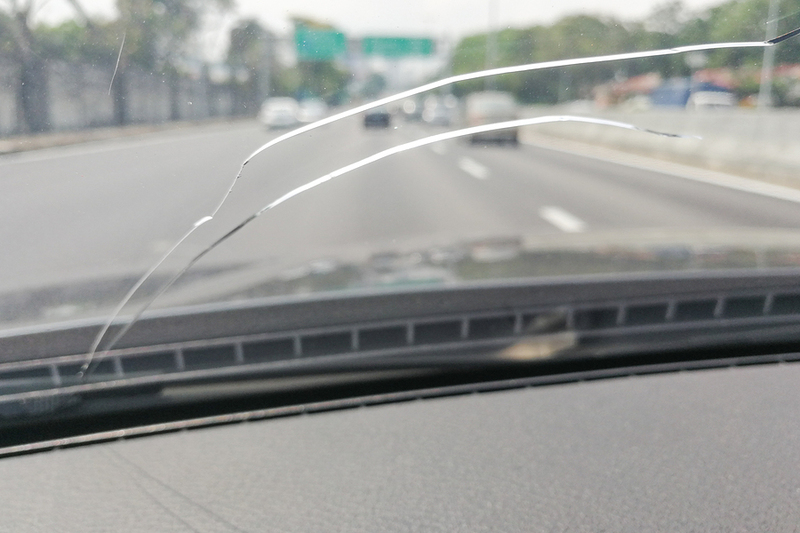 Drivers can still function properly with smaller cracks in their windshield and while we recommend seeing a windshield repair specialist for any crack, cracks up to an inch in diameter may not require you to drop everything to get it evaluated. Similarly, scratches or pits less than .15 inches deep are also not an emergency. If you do not pay attention to these damages, however, they may spread and turn into an issue that requires a trip to an auto shop or glass specialist for a replacement, or worse, an automotive accident that can result in injury, or at least, even costlier repairs. Cracks may expand due to weather and continued strain on the windshield. Additional damage may be done if you continue to drive through construction sites or park under trees with falling fruit. Even a bump in the road can lead to additional strain and damage. Pay attention to all of these factors as you continue driving with a cracked windshield. A small windshield crack won’t completely obstruct your vision, but any small distraction is dangerous for drivers. When you are focusing on the crack, you are not focusing on the road. The larger the crack, the more distracted you (and other drivers) will be. If your windshield cracked due to hail or extreme temperatures, putting your car right back in those conditions opens up the door for more damage. Park your car in the garage or under the shade if you have room. (The garage will be safer, as you don’t want anything falling from a tree and adding more damage!) Controlling the temperature around your car will prevent further cracks. If you are driving during the summer, turn on the air conditioner slowly to properly transition the car so it can handle both hot and cold temperatures. The same rule applies for winter and your car’s heater. If the crack is small enough, you may be able to repair your windshield yourself. DIY kits are available at an auto shop, online, or at a larger retailer. These kits contained detailed instructions on how to fix your windshield, and tools like syringes and adhesives that will fill the crack. Handymen who want to speed up the process may be able to get the job done within a day, but the quality of the repair will not match what you get with a professional. The tools provided by these kits may not be as effective as the tools in professional shops, and without a lot of experience repairing windshields, you may find the job harder than expected. If you want to get even more DIY with your repairs, search for some nail polish or any type of cyanoacrylate glue. Once dry, the liquid will be able to hold the crack together for a period of time until you need to get the windshield professionally repaired or replaced. If you don’t have either of these options, or want an extra layer of protection, add a piece of clear tape to the outside of your windshield. The tape will prevent dirt and debris from getting inside the crack. Even the strongest tape will not hold up to rain and snow, and is only a temporary fix while you schedule an appointment with a professional or go out and purchase a DIY repair kit. Applying super glue or taking a stab at repairing your windshield come with risks, so it’s best to take your car to an auto glass specialist who can properly assess your windshield. Different types of cracks and damage may require different repairs, and no one knows these damages better than the professionals. The team at Allstar Glass Corporation makes rock chip repair and glass replacement easy for you. Our specialists have 20 years of experience repairing auto glass and making the road safer for Houston drivers. Request a quote today and learn more about how we can help you repair windshield cracks on your vehicle.